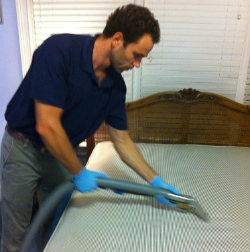 Mattresses require professional cleaning to be in healthy condition which should be done at least twice in the year. We can offer you highly professional and effective mattress cleaning which is suitable to be used in domestic and commercial estates, located in Putney SW15 and nearby. Our team of cleaning technicians are fully vetted, trained and do the work with the help of powerful and advanced machines for sanitising. The cleaning is done according to the mattress type and ensures complete removal of stains, bed bugs, dust mites and allergens. If the mattresses in your home, rented flat, hostel or other property need professional cleaning, contact us over the phone or online. Our cleaning staff will do the required work at a suitable for the client day and time. They will inspect the mattresses and apply the most appropriate cleaning methods on each of them. We can assure you that after the work is completed your mattresses will be perfectly clean. Our employees use effective stain removing products which leave no residue and ensure complete extraction of dirty spots. They work with high-end steam cleaners which disinfect the mattresses deeply and extract all dust mites and bacteria. After the mattress is cleaned, it will be deodorised and ready to be used. Rely on our company, located in Putney, to provide the mattress cleaning which you need. Over time mattresses can get very dirty and although there may not be any visual sign, this can lead to many health problems. Our mattress cleaning services, which we provide in Putney SW15, guarantee perfectly healthy and impeccable beds. Take advantage of them and you will sleep in a hygienic mattress which won’t cause you skin irritations and health problems.